“If I can, I like to do what I can to help. I take food to my neighbors and an elderly couple whose wife has dementia. 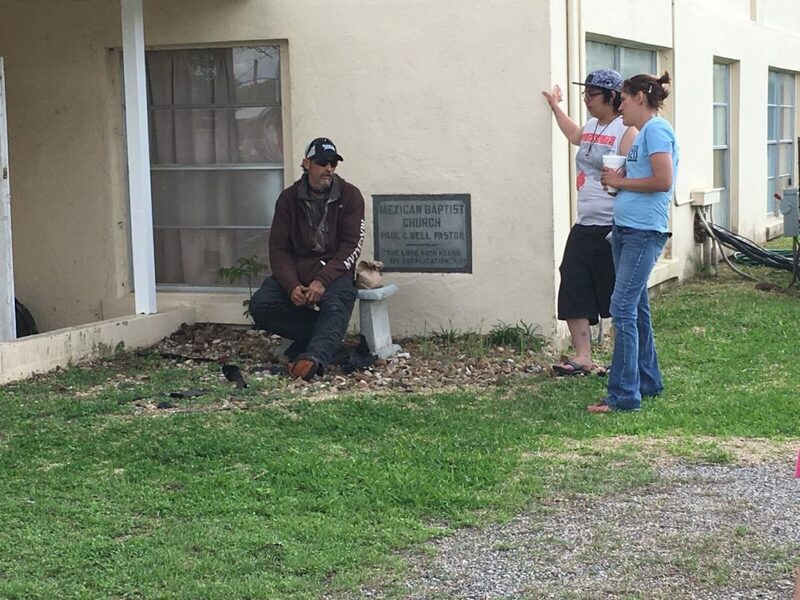 I am now better equipped to share the gospel with them when I drop their food off,” he said. Feed the Need Missions is grateful for people like Henry who work beside us to provide for our community. Click HERE to find a site near you and join us in Feeding The Need. Enduring the loss of loved ones, surviving two floods, and rebuilding their life after three wildfires, has certainly taken its toll on Mike and Jane Haley. While the fires were angry and consuming every thought, every second, every ounce of positivity from the Haleys, God brought Feed The Need Missions exactly where He needed them to be. 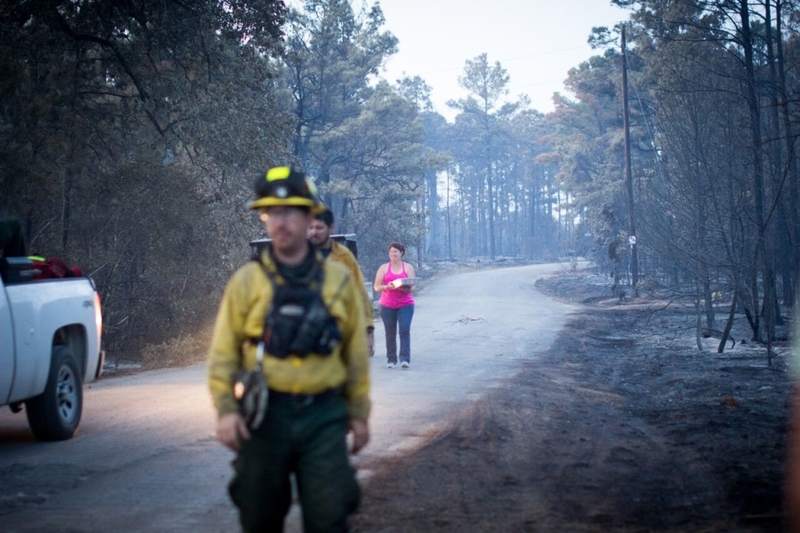 On October 13th, 2015 the “Hidden Pines Fire” began its raging descent across Bastrop. The Haleys quickly were rendered helpless with the loss of water and electricity. Daily, Jane would leave their home to visit the Smithville Fire Department and fill plastic containers. On one of those exhausting trips a thin, blue-eyed young man name Bryan offered to assist Jane in filling the water jugs and carried them to her car. He shared with Mary that his mother had been in the fire zone and he spoke of God’s goodness and His protection. Jane was finding it difficult to think of a protective and good God; especially when a fireman confirmed, “It’s headed your way.” Bryan comforted Jane with a sweet smile and a promise of prayer. It was a surreal environment at home as Jane and Mike gathered what they regarded as most important while grimly watching their cattle herded into trailers and taken away. From their porch, they watched the smoke as it approached, Blackhawk and Chinook helicopters dropping water on the growing fire, and a DC3 jet dropping orange retardant. Despite all these efforts, the fire continued to rage closer. One morning, Jane and Mike simply wanted coffee. Driving into Smithville once again, they noticed people outside the Smithville Recreation Center. Our Feed The Need Missions crew quickly greeted them with breakfast and coffee. Jane and Mike were so touched they asked to join the team for lunch preparations. Joining hands with Feed The Need Missions provided a positive environment for Jane and Mike to be distracted, if only for a little while. Later that night Bryan and Barb delivered a warm dinner, encouragement, and friendship to the Haley’s home. Overwhelmed once again with the ‘impossible generosity of strangers’, Jane and Mike hardly had words to express their gratitude for a hot dinner prepared by servant hands. The Haleys returned the next day for breakfast and again stayed to prepare for lunch. As they were standing in the line serving, Mike received THE call on his cell stating, “If you have anything of value in your home, get it and get out now.” The fire was coming, and they had to get home immediately to get their bags, dogs and cats and leave. Despite the busy lunch rush the Feed The Need Missions Team surrounded Jane and Mike embracing them as they trembled and wept lifting them up in prayer. Feed the Need Missions has started a new series called Table Talk each week at two of our sites. Table Talk is designed to help foster conversations about God’s Word and the Gospel. During our time together, we watch a short video about a section of the Bible or word study, followed by a discussion time about what we learned. Want to know what’s even more exciting? This past week we saw a video on the book of Leviticus and the sacrifices. As we were talking about the sacrifices a young lady was overwhelmed by the idea of all the sacrifices and asked “since that is in the bible do we still have to do that today?” This provided a great opportunity to share the Gospel showing how Jesus was the ultimate sacrifice. The look on her face as it all came into perspective was so moving. This then led to discussions about baptism. Because of that discussion, we now have serval people that have learned it’s time for them to get baptized! Praise Jesus! God is and will continue to do great things through Table Talk! What an exciting time for the people coming to our sites! Training is essential to help maintain consistency in the mission God has called us to. We have designed four levels of training to help equip and empower volunteers to be effective in Feed the Need Missions. Currently for August we have three scheduled training opportunities: August 11th, August 18th, and August 31st. These training sessions are for anyone who wants to learn more about Feed the Need Missions and for existing volunteers. Children are welcome to participate and a light lunch will be served. Join us for one of the training sessions in your area. Please contact Jace Allen at 512-621-9928 to RSVP or with questions. Please contact Gustavo at 713-518-3275 or Jonah Beyer at 512-988-8365 to RSVP or with questions. Please contact Brandon Phifer at 214-535-6373 to RSVP or with questions. Alma is a single mom to Jacqueline, her 19 year old daughter from Stony Point. She got pregnant at the age of 22 and continues to raise her daughter on her own with the help of family. She was born in Mexico and came to Texas when she was just a year old. In May of 2019 Feed the Need Missions will celebrate two years of serving the Stony Point community were Alma and Jacqueline reside. Alma joined us one evening for food and fellowship and three weeks later she began serving on the food line where she’s now the “line leader.” “Serving fills my heart with joy. I like seeing the people gather together,” Alma said. Thank you Alma! Feed the Need Missions is proud to have you on our team. Feed the Need Missions would like to invite you to join us for our quarterly volunteer training. If you are interested in serving and/or finding out more information about Feed the Need Missions we would love for you to be our guest. For those of you who are currently serving come participate in the training to receive updated information. Please arrive a few minutes early to get checked in. Lunch will be provided and children are welcome to participate in our training. Please contact Jace Allen to RSVP and for questions at 512-621-9928. Taco Tuesday is a day when we get to all come together for the love of tacos and rejoice in meaty-taco-goodness at a local church. As if Taco Tuesday was not enough, we also get to enjoy fellowship and raise awareness about Feed the Need Missions! Tacos for the win! Let’s get excited! Our first Taco Tuesday event will be April 24th from 7:00pm – 8:00pm, (or until we run out of these delicious creations). Join us at the Good Shepherd Lutheran Church in Bastrop to fill your belly with tacos!